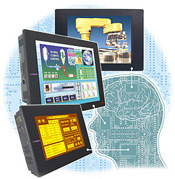 Maple Systems Human Machine Interface (HMI) and Operator Interface Terminal (OIT) products are affordable touchscreen and alphanumeric terminals that interface with over 80 families of PLCs and motion controllers, including Allen-Bradley, GE IP, Siemens, and many others. Looking for just the right graphic interface? Our HMI500 Series touchscreens are just what you need. With powerful, reliable hardware and the latest in analog-resistive touchscreen technology, our HMI500 Series touchscreens provide value-packed solutions for any application. Want a totally customizable alphanumeric OIT at an amazing price? Then you'll love our MicroOIT Family operator interface terminals. These powerful OITs are packed with customization features like user-defined keypads and extremely customizable displays at a price that's substantially lower than similar products on the market today. With a combination of powerful hardware and easy-to-use configuration software, our compact MicroOIT family provides value-packed custom solutions for any application. When human and machine function together intuitively, interaction becomes effortless. Introducing the HMI900 Series of graphic touchscreens — human machine interfaces so intelligent and versatile they will forever change the way you experience automation control. The OIT Family of alphanumeric OITs supports your applications with additional features such as larger text displays (up to 8-lines by 40-characters) and tactile key feedback. Some models in this family also include status LEDs, slide-in legends, a printer port and a real-time clock.